Today the ADAC yacht club probably does no longer exist. My next door neighbour is employee of the club, she doesn’t know anything about the existence of the yacht club. Instead there are many other yacht clubs members of the ADAC, which is an automobile club. Description of flag#1: It is a white triangular pennant, divided by a reddish Scandinavian cross with yellow and black fimbriation (colours of German national flag). 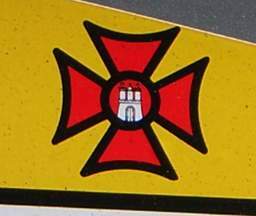 The intersection point of crossbars is superimposed by a white roundel with red-yellow-black fimbriation containing a black eagle, surrounded by black capitals in German Fraktur script “ADAC”. The horizontal crossbar is shaped like an arrowhead at the flyend. In the upper hoist is a diagonal black anchor with a rope. I was reading my car club newsletter where there is a report from 100 years of german national auto-club ADAC. It includes a photo from 50 years celebration held in 1953, showing president Theodor Heuss (first West German president 1949-1959, serving two terms) visiting ADAC. In the background there is a flag of ADAC, vertically displayed - white with black cotized Scandinavian cross on the center of which is a black bordered white disk with black displayed eagle between letters ADAC written in German Fraktur. What strikes me as odd is that the flag has certainly a political connotation that I find unusual for 1953, though certainly this is not based on the Nazi flag, but the older Imperial banner. Is the flag still used? An actual ADAC boatflag (Allgemeiner Deutscher Automobilclub, Munich, Germany) was just sold at eBay. Very much like what I saw in 1953 photo. Of course, there the flag was rectangular and without the anchor, but that is quite expected, right. The colours I was not aware, I assumed the "Prussian" cotized cross (i.e. like Imperial naval ensign), but obviously the cross is red with yellow and black borders. Its nearly the same like #1 but not ending in an arrowhead at the fly. White pennant with a red saltire. It is a white pennant with a red cotized cross. White pennant with a thin black triangle stretching from hoist to fly. Three blue-white-red triangles fitted into each other. Black pennant with a yellow arrow pointing to the hoist. A pennant quarterly divided by a white saltire, black-red-red-black. Description of flag: It is a white triangular pennant, divided in the middle by two blue parallel horizontal lines. Shifted to the hoist the lines are superimposed by a red sail over a white sail. Red pennant with a blue chevron fimbriated white. Three red-white-red triangles fitted into each other. Red-white-red are the colours of Greifswald. White pennant with five red-white-black-white-red (1:1:2:1:1) chevrons. Or Segeltechnische Arbeitsgruppe an der RWTH-Aachen e.V. - Green pennant with an orange arrow head pointing to the fly. Flag of the RCA also in this webpage. White flag with a red cross, the arms of Hesse in the canton and a blue anchor in the lower hoist. Vertically divided red-blue, with a yellow disc stretching equally over the red and blue fields. The river Alster crosses Hamburg from North to South and is tributary of the Elbe. Pennant divided per saltire, blue-white. Horizontally divided red-white with a stylized A countercharged. Altmühltal is the valley of the river Altmühl, tributary of the Danube in Kelheim, between Ingolstadt and Regensburg. Black pennant with a yellow Scandinavian cross. Altona is a part of Hamburg city. Blue field with three white-red-white thin vertical stripes at hoist, the letters AIYCB in white placed vertically in the red stripe, and a white eagle spreading its wings on the blue field. Red flag with a big blue canton with a white thin diagonal stripe and a white star on each side of the stripe. The club is situated in Ammerland, a village on the south-east shore of the Starnberger See south of Munich. King Ludwig II of Bavaria drowned in the Starnberger See in 1886. Whether it was an accident caused by his mental disorders or an assassination intended to end the independence of Bavaria remains controversial. Nautic Club Ammersee (Bavaria) - Dark blue burgee with four triangles (with different shapes!) and a yellow steering wheel. Ammersee is a Bavarian lake located south-west of Munich. Red pennant with a white fly separated by a serration. Three stylized sailing boats (white sail over black hull) in the red field. Ansbach is located in Middle Franconia, west of Nuremberg, on the river Frankische Rezat. Gunzenhausen is located 20 km south-east of Ansbach, on the river Altmühl. The serration on the flag recalls the Franconian rake. White pennant with a black border, divided by a black scandinavian cross. In the middle of the cross, a red disc including a white hexagram pointing towards upper hoist. Source: yacht club website. Argo was the vessel on which Jaso and the Argonauts sailed to Colchis to capture the Golden Fleece. They succeeded with the help of the magician Medea. On the way back, Jaso abandoned Medea, who by revenge cut the throat of their children. The story inspired several writers such as Euripides, Seneca and Corneille, as well as the movie maker Pier Paolo Pasolini, with Maria Callas as Medea. It is a red pennant divided by a black saltire, which is in the centre superimposed by a white disc. Source: I spotted this car-sticker on 18 February 2007 in Hamburg-Eilbek. It is Arnisser Segelclub e.V., first burgee on the list, here. See p. 41 of pdf file for burgee history, here (click "Festzeitschrift Seiten 30 - 41"): Klaus-Michael Schneider was right - one of the many North German clubs. It is a white pennant with 8 black trapeziums forming a centred cross. In the upper hoist is a red crescent with its horns facing the hoist. The pennant shows the coat of arms of the city of Attendorn. It is a yellow pennant, divided by a white cross, cotized black and white and shifted to the hoist. In the canton is a red Maltese cross cotized black with a disc in its centre with the small arms of Hamburg. Source: I spotted this car sticker on 4 September 2008 in Hamburg-Borgfelde. Flag was identified with help by Jan Mertens.